Royal Rainier is a large yellow cherry with excellent flavour and holds well on the tree. Taste test winner. Suited to warmer temperate climates, where there isn't as much chill. Multigrafted with Stella for cross pollination. 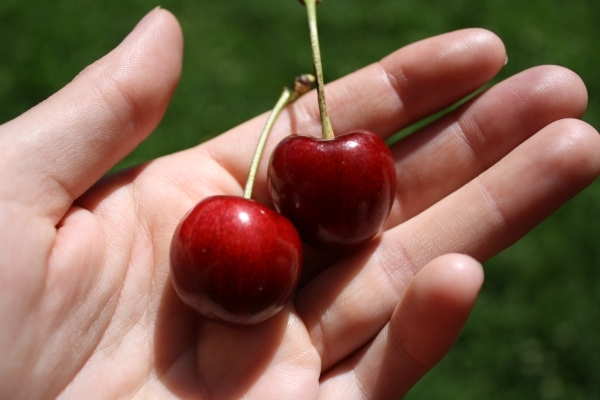 Stella - A large, sweet flavoured cherry, red to dark red in colour. Produces large crops in clusters. An excellent choice for the home orchard. Suitable for small to medium gardens. Because there are 2 different varieties on the same rootstock eg multi grafted they pollinate each other so you do not need another pollinator. It is like buying 2 plants in one. 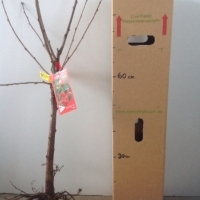 Milti Graft = more than 1 graft on the same rootstock in this case there are 2 different cherry varieties on the same tree. No it is not Dwarf root stock but that is quite a large pot and it will stay smaller via root restriction you should be right. Age perhaps 2-3 years. This is for temperate climates please see specification for climate. Coffs may not be cold enough and it could be marginal. Good question would be do you know anyone that is growing cherries in your area. Bears fruit in 2-3 years. Taste will be great on these. Also another pollinator is not needed as this has both pollinators already.